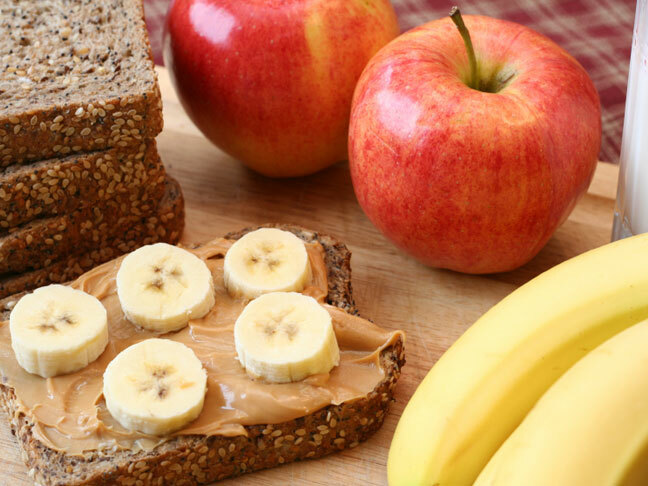 Lunchbox Nutrition: Which Kind is the Better (Nut) Butter? In my house, protein packed peanut butter is as essential as butter, flour, eggs and milk. But what about other nut butters—do they measure up? With back-to-school kicking into high gear, it’s time to find out! Whether you’re looking for a peanut butter alternative because your family doesn’t like the childhood standard or—like mine—likes it so much that you’re craving variety, this quick overview of nut and seed butters will help you find the taste you want and nutrition you need. Most nut and seed butters are nutritionally comparable (with the exception of macadamia nut butter, which is best left a splurge). Though there are some differences—soy nut butter has more protein than the rest, almond butter the most fiber—the discrepancies generally range from a 1-3 grams. So, basically, choosing for taste will not steer you wrong. Unless, of course, you need to meet specific dietary needs. These nutrition notes are based on a comparison of pure nut butter with no added salt or sugar. Be sure to scan the sodium content of your butter of choice, as most have added salt. I recommend avoiding butters with added sugar. It’s just not necessary, especially when paired with the usual suspects: jam, honey or fruit. If you can’t find nut butter without added sugar in your supermarket, check your local health food store or make some yourself! More than even salt and sugar, be sure to avoid nut butters with “partially hydrogenated oils,” aka “trans fats.” Even if there is no trans fat listed per serving on the nutrition label, they’re in there if partially hydrogenated oils are in there. How do you know if you’ve got partially hydrogenated oils? Be wary of any nut butter that doesn’t require stirring or refrigeration and, of course, check the label. The gold standard for a reason, peanut butter is chock full of unsaturated fats (great for regulating cholesterol), potassium and, of course, protein. It’s also as rich in antioxidants as many fruits! One of the antioxidants found in peanut butter is the same found in red grapes and red wine thought to be responsible for the French paradox. Who knew?! Don’t limit PB&J to the lunchbox. Peanut butter is a great way to start the day. Spread on toast and drizzle with maple syrup for an on-the-go breakfast or make PB&J French toast for a more decadent weekend brunch. Just dip a PB&J made with challah bread in egg that’s been whisked with a little milk and vanilla, and fry! Mild and silky, almond butter is low in saturated fat and high in fiber. Compared to peanut butter, it’s a great source of vitamin E, iron and calcium. In fact, almond butter provides eight times the amount of calcium. Go bone strength! Use almond butter to give dessert a nutrition boost. Take inspiration from the candy bar aisle and spread a plain butter cookie with almond butter, drizzle with chocolate sauce and sprinkle with shredded coconut. Creamy like peanut butter, but with a lighter flavor, cashew butter is a very good source of monounsaturated fats and copper and a good source of magnesium. It’s slightly higher in saturated fat compared to all of the other nut butters (except macadamia), but only marginally so. Cashew butter has a luxurious feel that goes great with fresh ricotta or even a goat cheese. Skip the jelly and substitute a mild, spreadable cheese on your favorite bread. Top with a drizzle of honey. Made from seeds, which are different than tree nuts, earthy sunflower seed butter is lower in protein that most nut butters, but allergy friendly. This rich butter is safe for nut free classrooms and a great source of both vitamin E and magnesium to boot. Sunflower seed butter is most commonly used as a straight allergy-free substitute in any recipe that calls for tree nut butter. With a rich flavor all its own, it’s worth a try even if you can eat tree nuts. Try it in a smoothie whirled with milk, banana, honey and some cocoa powder. This smooth spread, which tastes similar to peanut butter, is made from whole soy beans that are processed to taste and be used like nuts. In the case of soy nut butter, the soy beans are oil or dry roasted and ground into a paste with some oil. Soy nut butter has lower fiber content than most nut butters, but the most protein of all the butters listed here. Take advantage of soy nut butter’s high protein to make a well-rounded vegetarian dinner. Whiz some with vegetable oil, a drizzle of sesame oil, rice wine vinegar, honey, lemon zest and sriracha. (Thin with water if necessary.) Dress cold soba noodles or angel hair with the soy nut butter dressing and top with veggies— cukes, carrots, red pepper, shelled edamame—and cilantro. While healthier than sugar-packed chocolate-nut spreads, macadamia nut butter is more of a special treat than the others listed here. It has the least protein, most fat and saturated fat. The upside—other than a rich taste!—is that it’s relatively low in carbs. This is not a butter you use to make an everyday lunchbox sammy. Instead, save it for a decadent bite. Smear macadamia nut butter on crusty bread, drizzle with caramel sauce and sprinkle with sea salt. Yum! What’s your favorite nut or seed spread? One of these or something not listed? Let us know!